Wishing you and yours all the best this holiday season from all of us at the Roncesvalles Village BIA. Please note our office will be closed from December 24th at noon until December 26th, and January 1st. This entry was posted in ARCHIVE, Uncategorized on December 19, 2017 by Veronica Feihl, Executive Director, RVBIA. The Roncesvalles Polish Festival is Hiring! The Roncesvalles Polish Festival is the largest celebration of Polish culture in North America. We’re currently seeking a Sponsorship Manager who will work with the RVBIA and the festival management team to meet the Festival’s sponsorship targets through the acquisition of cash, grants and in-kind. This position will also include sponsorship administration, event coordination/management,and partnership liaison and coordinating Official ceremonies and VIP events. Review and analyze the RVBIA’s current sponsorship program and develop new materials, in conjunction with the RVBIA Operation Team. Develop a sponsorship timeline and plan for the Roncesvalles Polish Festival..
Take responsibility for the identification, solicitation and procurement of potential sponsors. Assist in maintaining and enhancing services to existing sponsors, and to promote sponsorship level enhancement. Negotiate sponsorship arrangements, prepare and send sponsorship contract and obtain signatures. Prepare and send Sponsorship invoices as per contractual terms of agreement. Provide interim reports including progress, expenses and budget for festival management team. Collect, file and ensure the safe transfer of all Sponsor logos to be used in marketing, promotions and advertising. Ensure material required for sponsors deliverables as it relates to advertising timelines are strictly adhered to. Obtain approval from sponsor for all advertizing that includes sponsor graphics. Ensure Sponsors are given appropriate placement along the Festival route, as is presented or negotiated in the agreement. Ensure appropriate recognition and exposure is delivered to sponsors and that there will be no confusion or competition between Vendor and Sponsor levels. Maintain and promote our strong relationship with the Consulate General of the Republic of Poland in Toronto, The Polish Embassy in Ottawa, representatives involved with the Canadian European Trade Agreement and within the local Polish community. Provide a final report two weeks following the event. Post-Secondary Education in Project Management, Marketing, Event Management, Fundraising, or similar. Flat fee of $7000, based on a goal of raising $70,000.00 in sponsorship, payable in 5 installments of $1,400.00 upon receipt of interim reports on January 31, March 31, May 31, July 31, August 31. Plus 10% of any new sponsorship contracts above the $70,000.00 budgeted target. *Grants that require co funding by the RPF will be negotiated individually. To apply send your cover letter and resume to info@nullroncesvallesvillage.ca. This entry was posted in ARCHIVE, Events, Polish Festival on December 5, 2017 by Veronica Feihl, Executive Director, RVBIA. 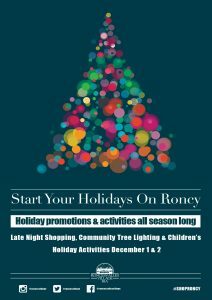 Start Your Holidays on Roncy! The Holiday Season is fast approaching. Kick it off with us on December 1 and 2! On December 1st Shop Roncy Late. Participating shops will have promotions, sales and activities until 9:00PM, with select shops staying open until 10:00 PM. December 2nd bring your family to Roncy and visit Santa at Willem and Jools at 125 Roncesvalles in the early afternoon before you make your way over to the High Park Library for story telling followed by a fake snowball fight on the Library lawn. Carolers will sing in the season during the day and at dusk as our community tree is lit in front of the Roncesvalles United Church. There is no cost for our community events, but we encourage you to bring donation items for the Roncesvalles United Church Sunday Meal Program, Dinner with Dignity. This program serves 16,000 fresh meals per year; lunch and dinner every Sunday. Every little bit helps! The church accepts donations Monday to Friday between 9:30 AM and 5:00 PM or all day Sunday. We will be accepting perishable food items on their behalf from 4:00 PM – 5:30 PM on December 2nd. Holiday deals continue along Roncy all day long! Donations accepted outside from 4:00 PM – 5:30 PM. Otherwise please bring them to the church office. Follow our Event Page to stay up to date! This entry was posted in CURRENT, Events, Our Neighbourhood, Our Roncesvalles, Special Events, Uncategorized on November 13, 2017 by Veronica Feihl, Executive Director, RVBIA. Our Volunteer Appreciation Dinner, this year was once again a huge success. We are so lucky to live in a village in this big city, where many of our residents and shopkeepers believe in contributing their time and effort — and cash — to making our community better in so many ways. Having people who are willing to spare time for volunteer work is not something we take for granted, Life get’s so busy that it’s hard to fit in one more task. Yet, so many in this community make time despite the pressures, and for that we are so grateful. For the second year, we held The Roncesvalles Volunteer Appreciation Dinner to thank those who contribute significant time to the enhancement of our street and the BIA’s community events. Our special guest this year was Carolyn King of the Mississaugas of the New Credit First Nation, who was also an early champion of the Dundas Roncesvalles Peace Garden. She was involved in sharing heritage stories, and inspiring young artists in making designs for the Peace Path. She consulted on native trees and plants as well as the Garden design, and continues to be a Friend of the Peace Garden. Carolyn initiated the Moccasin Trail project, which marks places of Indigenous history and invites observers to understand why these places are significant. The Peace Garden is marked with the Anishinaabe moccasin design. Carolyn is a leader in advancing the causes of recognition, renewal and justice for her people. She encourages better relations with Canada’s Indigenous people, and is a model of inspiration for Indigenous and Non-Indigenous people alike. To know her is to love her, and to laugh with her, whenever possible. Roncesvalles Abroad Award for volunteer efforts extending from Roncesvalles and beyond. Emma Coulter: for her ever increasing commitments to the Dinner With Dignity program at the Roncesvalles United Church which serves 16,000 meals per year. And last, but not least, a very special heartfelt thank you to David Neinstein of Barque Smokehouse and Barque Butcher Bar who orchestrated this wonderful event, and for our Masters of Ceremonies: Reverend Anne Hines of the Roncesvalles United Church and Brian Bertrand of the High Park Library who challenged our knowledge of the Village, kept us laughing, and helped make this evening one to remember. 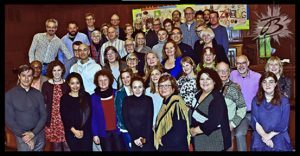 This entry was posted in Community News, CURRENT, Events, Kudos!, Our Neighbourhood, Our Roncesvalles, Uncategorized on November 13, 2017 by Veronica Feihl, Executive Director, RVBIA.